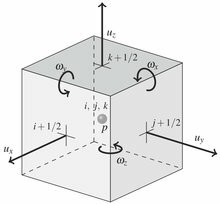 Helicity is the scalar product between velocity and vorticity and, just like energy, its integral is an inviscid invariant of the three-dimensional incompressible Navier-Stokes equations. However, space- and time-discretization methods typically corrupt this property, leading to violation of the inviscid conservation principles. This work investigates the discrete helicity conservation properties of spectral and finite-differencing methods, in relation to the form employed for the convective term. Effects due to Runge-Kutta time-advancement schemes are also taken into consideration in the analysis. The theoretical results are proved against inviscid numerical simulations, while a scale-dependent analysis of energy, helicity and their non-linear transfers is performed to further characterize the discretization errors of the different forms in forced helical turbulence simulations.